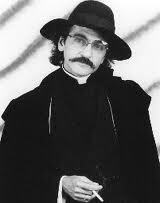 Hopefully you all remember Father Guido Sarducci "Special Vatican Reporter" (played by Don Novello - an American writer, film director, producer, actor, singer, and comedian) from his many appearances on Saturday Night Live and other comedy shows. As is my muse's wont, we channeled Father Guido Sarducci and came up with the following two pieces. I sent them to Lane Sarasohn, Don's manager and here's his response: "I've forwarded your pieces on to Don. The pieces are very excellent. You have a fine ear and a fine sense of humor. I'm a comedy writer myself (Groove Tube, Not Necessarily the News) and I don't often see really good comedy writing. I'll let you know Don's reaction after I have my next phone conversation with him. Wishing you all the best, Lane." FATHER GUIDO SARDUCCI BIT – SAINT JOSEPH (on Weekend Update w/Seth Meyers) You know-a people ask-a me all-a the time about miracles. And-a they say, ‘Why is Saint-a Joseph a saint-a? He just-a married Mary and-a was-a the step-a-father to Jesus. He didn’t perform-a three-a miracles, which we all-a know is what-a you have-a to do to-a become-a a saint. It’s-a true. For all-a you non-Catholics, in order to become-a a saint-a, you have to perform-a three miracles. And-a they gotta be-a good ones. Not just like-a building a house-a from a deck of cards. That-a doesn't count. Or finding a quarter in-a somebody's ear. Or sawing a lady in-a half and putting her back together again. Those are just-a magic tricks and don't count as-a miracles. But-a you know, he did-a invent-a Saint-a Joseph’s Aspirins. Think of all-a the lives he’s-a saved with-a those tiny little aspirins. People take-a the Saint-a Joseph’s Aspirins to-a prevent-a the heart attack. That’s-a more than-a three-a miracles to me. Well, as-a always, it’s-a been more than-a wonderful being with-a you. FATHER GUIDO SARDUCCI BIT – SAINT BY NUMBERS - (on Weekend Update w/Seth Meyers) You know-a Christmas time is-a here, well, it’s-a still around-a the corner, but it’s-a close, and I think-a we should-a keep-a the Christ in-a Christmas. So, I have-a a nice-a gift here – and it’s-a a really a gift for all-a ages. You’ve-a heard of the Paint-a by Numbers-a Kits, well, this is-a Saints by Numbers-a Kit. [Holds up thin box approx. 12x12x2. It’s got Saint Peter on the box cover.] See, this is-a Saint-a Peter. He’s-a the guy waiting at-a the Pearly Gates-a for us with-a that-a big-a book to see if we get into Heaven or-a not. He was-a the first pope in-a the year 32. It’s a true. He was-a good friends-a with-a Jesus and a disciple, so I guess-a he had a little pull, you know? So, he’s-a Saint-a Peter and-a because he’s-a the only one named-a Peter, we don’t-a have to call-a him Saint-a Peter the first. You know lots-a the pope they-a like to-a show-a respect for a previous-a pope, so they-a take their name and-a change the number. You know, like-a you have-a the father, John-a Smith. He names-a his son, John-a Smith, Jr. So-a now the father becomes-a John-a Smith, Sr., and when-a the son, John-a Smith, Jr., has a son and-a names-a him John Smith too – also, not-a two like-a the number 2 – the grand-a father, John-a Smith, Sr., he-a remains-a Senior, and his-a son, John Smith, Jr., remains-a Junior, but-a his-a son – the new baby – becomes-a John Smith-a the third. So, the popes – you can’t-a have-a children cause-a they’re not allowed to get-a married, they like-a to take-a the names of other popes. Sorta like-a copy cats, I know. Saint-a Peter was-a the pope from-a the year 32 to-a 67. And-a you know, it’s-a job-a for life. You don’t-a work at-a the Vatican for twenty, thirty years and-a get-a the gold-a watch and-a have-a the retirement party and-a go the old popes-a home in-a Sicily or-a something. Though that’d would-a be a nice idea. After Saint-a Peter died-a, next came St. Linus. I think-a he was-a the one to start that whole-a security blanket thing, I’m-a not sure. I heard-a that he so respected Saint-a Peter, that-a he wanted to change his name from-a Saint Linus to-a Saint Peter the second, but-a he was afraid-a that-a maybe there’d-a be some-a mix-up in-a the hereafter and he’d-a end up standing-a at-a the Pearly Gates with-a that heavy book. Then-a we got Saint Sixtus the First which could-a sound a little bit-a confusing with-a the sixtus and then-a the first, but that-a was-a his name. He was-a probably the sixth-a child in-a his family and so was-a named Sixtus. They weren’t all-a that-a original back-a then. He was-a pope-a from-a the year 115 to 125. Oh, I like-a this one. This is Saint Hyginus the first. From-a the year 136 to 140. He was-a very clean pope. And this is Saint Hilarius – I’m not-a kidding - the first. From-a 461 to 468. There was-a lot of laughing going on at-a the Vatican for those eight-a years. Then-a we got-a Saint Innocent the thirteenth. From-a 1721-1724. He looks-a kind of innocent to me. Some of these-a guys got a little carried away with themselves, you know. Going from Innocent to Pius. That’s-a pretty big-a statement to me. You know, it sort of leaves-a you wide open for people to catch-a you doing something-a maybe you shouldn’t-a be doing. This is Saint Pius VIII. Yeah, seven guys before him were feeling pretty cocky about-a their holiness. He was only pope-a from-a 1829 to 1830. Maybe he found it hard to remain so-a pius. Most of you probably remember Pope-a John Paul. Every time I hear that-a you know I expect to hear George and-a Ringo, too. He was only pope for a year – 1978. I think in-a the Godfather [holds up three fingers] Part III, Michael [Al-a Pacino] Corrleone is-a at-a the Vatican when Pope-a John Paul died. I’m-a not saying the Mafia – or Cosa Nostra - was-a involved. You draw you own-a conclusions. This, of course, is Pope-a John-a Paul – there, you’re expecting the George and-a Ringo, too, aren’t you? – the second. He was-a the Pope-a from-a 1978 to 2005. They’re both-a Saints-a now. I think-a it had-a something to do with-a sounding like half-a the Beatles, but I can’t-a be sure. Finally, this-a Saints-a by Numbers Kit comes-a with a bonus. He’s-a not a saint so maybe he shouldn’t-a be in-a the box, but it’s-a the current Pope-a. Benedict the twenty-sixth. Again, that-a lack of imagination. He could-a chose any name for-a himself, you know - there are no Pope-a Frank’s, or Pope-a Billy’s, or Pope-a Clyde’s – but he picked-a Benedict the twenty-sixth. I guess-a his-a friends call-a him Benny. I don’t know. We don’t know if-a he’ll make it to-a saint-a or not. Well, as-a always, it’s-a been more than-a wonderful being with-a you. And-a remember to-a keep-a the Christ in-a Christmas. Merry Christmas everybody.